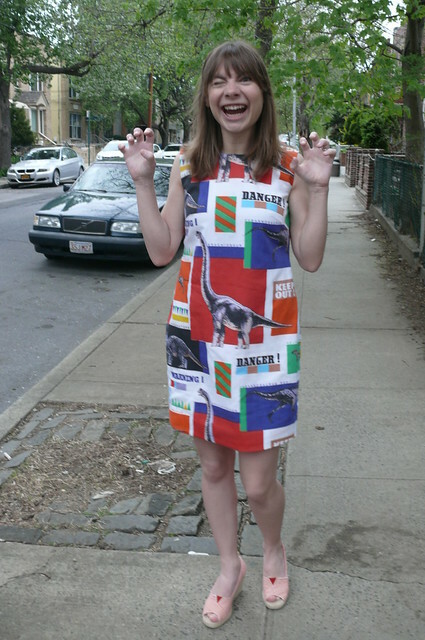 Colette Laurel, Or the Jurassic Park Twinsies Geeky Awesomeness Dress! Hold onto your butts! OK. I really, really, REALLY like this dress. I’m just going to say that right now. I know that it’s ridiculous, but I still really like it. A little backstory: like many people my age, I’m a huge, huge, HUGE fan of Jurassic Park. So when I spotted a set of JP sheets on eBay a while back, I snapped them up for a song. I wasn’t quite sure what to do with them, so they hung out in my stash for a year or so. Fast forward to this spring when I did a massive stash cleanout and decided I didn’t really need two whole sheets. I brought one to our meetup/swap with Lauren, and Devra suggested that we send it to Cindy (genius suggestion! ), a fellow dinosaur enthusiast. Cindy, also a genius, emailed me recently, suggesting that we make projects at the same time and reveal them on the same day (remember how much fun it was to see Andrea‘s S.O.S. Challenge?). Great idea, huh? I decided to use the Colette Laurel dress pattern for this, and it really worked out well! It’s the perfect pattern for a large-scale print, since there aren’t many seams to break up the print. 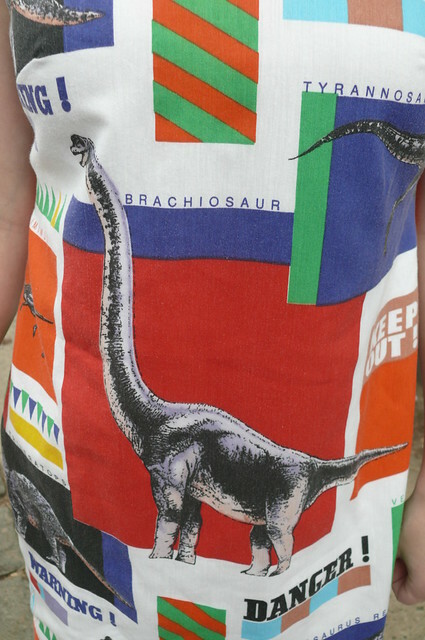 I squeezed two WHOLE brachiosaurs onto the dress! TWO! Major accomplishment, people! Brachiosaur! His head is comically undersized! 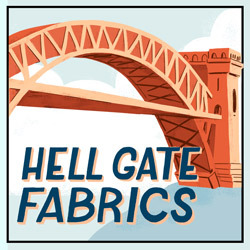 The pattern is a straightforward, quick make. I made two muslins for it because I had the weird armhole pulling issue thing that a few other people mentioned. I filled in the armscye (as described in this Flickr photo), narrowed the shoulders a bit, and lowered the bust darts about 1/2″. I also added 2″ to the length, and I omitted the zipper, cutting the back on the fold, as I can *just* wriggle into it without a zip. I decided to leave this version sleeveless for some reason– it just feels like a happy summer dress to me. 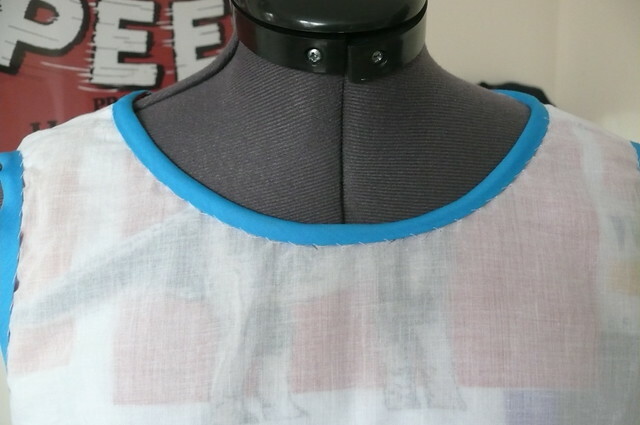 I lined it with white cotton batiste from my stash and used packaged bias tape from my stash to finish the neck and armholes, so the whole shebang is a pretty giant stash-bust for me! Look at all my patient little hand stitches! I love this style! It’s so sassy and youthful! Unfortunately, Man Friend is not a fan, as he offered his usual critique of anything not terribly fitted (“Needs a belt”), and he doesn’t want to go out in public with me in this dress. I guess I will just go have amazing adventures by myself in this dress, then I’ll just photoshop Cindy into all my pictures so we can have tons of fun together in our matching dresses, thousands of miles apart! Also. It says “Danger!” on my dress. Like fifty times. Win! I’m a mighty T-Rex! Fear me! Alright, guys, now go check out Cindy’s dress here! Well, it’s pretty darned cute. In fact, I can’t imagine anyone else in the world who make and wear a dinosaur dress and have it be just the perfect little thing! CUTE!